Perfect harmony of heat and flavor stuffed into natural pork casings. Crisp texture on the outside leading to a burst of flavor on the inside. This sausage is hot smoked producing a juicy, delicious all duck treat that is ready to eat in minutes. Product is fully cooked, ready to eat. Keeps 8 weeks in packaging. Smoked Duck Hot Links There are 2 products. 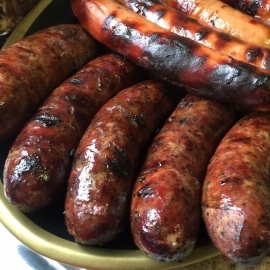 Applewood Smoked Duck Hot Links - 1 lb. Applewood Smoked Duck Hot Links - 3 lbs. Vacumm packed. 4 to 5 links per pack with a total net weight of at least 3 lbs.